One of the largest and rapidly developing metropolis in West Bengal, Siliguri is immensely significant for a number of reasons. It is geo strategically important lying close to state and international borders with the chicken’s neck Siliguri corridor connecting the mainland of India with the Northeast Border states of India. Post Indian independence, it has also developed as a major commercial, transportation, tourism and educational hub. Due to its proximity to the major hill stations of North Bengal, Sikkim and the North-east, it faces a large influx of annual tourists willing to spend their vacation in the higher elevations of this mesmerizing city. Lastly, the population of Siliguri surged after independence with migration from Bangladesh and continues to increase every day. Being a significant cosmopolitan city in the Himalayan foothills it makes it easier for people from the hilly regions to come here for economic and social opportunities. The administration of the civic infrastructure of this expanding city (in terms of area and population size) is thus a great challenge which is met through the efficient administration of Siliguri Municipal Corporation and other Siliguri civic bodies. The Siliguri Municipality originated in 1949 with its first office set up in Hill Cart Road. The Sub Divisional Officer (SDO) of that time, Sachindra Mohan Guha was its first chairman. Eventually, the Siliguri Municipality was given the status of a corporation in 1994. The Siliguri Municipal Corporation is uniquely situated in both Jalpaiguri and Darjeeling district. It has 47 wards, of which 17 are situated in Jalpaiguri district and the rest are in Darjeeling district. Education and Culture - It mainly takes care of primary education which includes felicitation programme for Secondary and Higher Secondary meritorious students, mid-day meals, issuance of ID cards and others. Electricity Department - It deals with development and maintenance of street lighting and project work under SMC areas. Public Works Department - This department deals with construction and widening of roads and drains. Other departments under Siliguri Municipal Corporation includes the General Department, Accounts Department, Birth & Death, Building Department, U.P.E. Department, City Water Supply, Purchase Department, Trade License, Establishment, Vehicles Department, Public Health & Hospitals, Market Department, Tax Department, Conservancy Environment, Cash Department, Tax Department, Law Department, Guest House Booking Cell and Sports Department. In addition, the municipal corporation is also engaged continuously in the process of city beautification, and citizen services like property tax department and receiving complaints and suggestions. 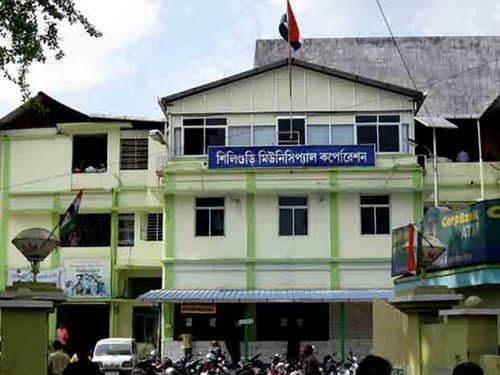 There are 5 borough offices under the Siliguri Municipal Corporation; Borough I, Borough II, Borough III, Borough IV and Borough V.
There are 7 committees under the civic body; Selection Committee, Advisory Committee, Tender Committee, Statue Committee, Purchase Committee, Special Committee and Promotion Committee. Originally Siliguri Municipality encompassed an area of 15.54 sq. km which was enlarged to 41.90 sq. km when it was given the status of Siliguri Municipal Corporation.